Tollywood Bengali film Basanta Utsav movie story review casting director producer cast of Basanta Utsav release date book buy tickets online Bengali Basanta Utsav Ritabrata, Pijush, June, Pradip, Arunima, Basanta Utsav Pijush, June, Pradip, Arunima, Bengali movie review shooting location, Bengali film Basanta Utsav cinema halls showing Kolkata Bengal show timings upcoming Bengali cinema Basanta Utsav watch online. Journalist Ritabrata Bhattacharya is making his directorial debut with upcoming Bengali film Basanta Utsav, releasing 29th March 2013. Journalist turned Film-maker Ritabrata Bhattacharya's first Tollywood movie Basanta Utsav [celebrating the Festival of Colours] has been produced by Roofers Media and starring June Malia, Pijush Ganguly, Arunima Ghosh & others. • Basanta Utsav Bengali movie Director Name: - Ritabrata Bhattacharya. • Basanta Utsav Bengali movie Producer name: - Roofers Media Pvt. Ltd.
• Basanta Utsav Bengali movie Editor Name: - Amitabh Dasgupta. • Basanta Utsav Bengali movie Cinematographer name: - Mrinmoy Nandi. • Basanta Utsav Bengali movie Music Director Name: - Debjyoti Mishra. Tollywood movie Basanta Utsav has total of seven melodious songs that are sung by Somlata, Nachiketa, Tulika Mandal, Mohon Singh & Debjyoti Mishra. The Bengali song Momo Chitte of Basanta Utsav already touched the heart of audience. • Basanta Utsav Bengali movie Lyricist name: - Radharaman & Dwijendra Das. • Basanta Utsav Bengali film Casts Actors Actresses: - Arunima Ghosh, Pijush Ganguly, June Malia, Priyam, Mousumi, Subrata Dutta, Ritabrata Bhattacharya, Piya, Larisa, Laboni Sarkar, Piyali, Pradip Mukherjee & many other. • Basanta Utsav Bengali movie Release Date: - 29th March 2013. • Basanta Utsav Bengali movie Story Review: - Basanta Utsav Bengali film is based on few short stories that happens during Holi [Festival of Colours / Basanta Utsav]. Over the year at Shantiniketan (Bolpur) thousands of people gathered to celebrate Holi and how unknown become known to each other & start loving each other - it's all about this movie Basanta Utsav. This movie has few short stories and now let’s checks out few of them. Story of Neil & Abhisikta - Art student of Visva-Bharati 'Neil' met 'Abhisikta', who is corporate lady, at Shantiniketan during Holi for the first time and they fall in love. Their love exceeded to extreme and how they rediscovered their relation it should be watched at your nearest cinema hall. Story of Anorgho & Sumitra - Professor Anorgho & his wife Sumitra came to Shantiniketan to celebrate Holi. But, Anorgho brought his extramarital affair 'Trina', who is a student of Anorgho, with them. Then how Anorgho, Sumitra & Trina's life changed that you must see at your nearest cinema hall. Story of Lina & Abinash - Lina, NRI lady, came to celebrate Holi at Shantiniketan for the first time and she met an elderly Professor Abinash. A sweet caring love relationship built up between Abinash & Lina during the spring festival. Story of Ritrin & Aabirlal - Famous TV reporter Ritrin came to Shantiniketan to telecast Basanta Utsav Live from Shantiniketan. He met a person 'Aabirlal' who came to solve an unusual murder mystery of his lover. Aabirlal's lover murder had happened at Shantiniketan and he is here to find out the guilty person. Ritrin & Aabirlal became good friends and Ritrin assured him of help. In the mean time, Aabirlal got runaway by a truck during Basanta Utsav; but his friend Ritrin couldn't do much. Tollywood Movie Basanta Utsav, directed by Ritabrata Bhattacharya, is a must watch movie, so don't miss it. • Shooting Location Spot of Basanta Utsav Bengali Cinema: - Most of the film has been shot in Bolpur (Birbhum district) of West Bengal. • Cinema Halls showing Basanta Utsav Bengali movie: - Let’s check out few Cinema Hall names showing Tollywood movie Basanta Utsav in Kolkata & across Bengal - Nandan (Kolkata), Priya (Kolkata), Star (Kolkata), INOX Multiplex (City Centre, Swabhumi, Rajarhat, Liluah, Burdwan, Durgapur, Siliguri), FAME Multiplex (Hiland Park, South City), Broadway (Salt Lake), Bioscope (Rajarhat), Jayanti (Barrackpore), Satyajit Mancha (Balurghat), Gitanjali (Bolpur), Kristi (Memari), Ajanta (Behala), Jaya (Lake Town & Barasat), Rupasi (Agartala) & many other Cinema Halls of Kolkata & West Bengal will be showing Basanta Utsav Bengali movie. 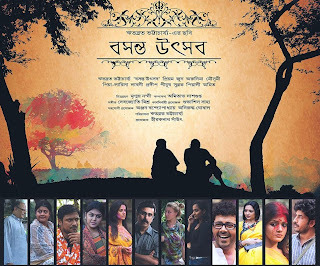 New Bengali movie / Tollywood film Basanta Utsav of Pijush, June, Pradip, Arunima seems to be worth watching in Cinema Hall; so start buy tickets online of Basanta Utsav from www.bookmyshow.com website. Singer Somlata weds Akash, Somlata Acharyya & Akash Roy marriage photos, Singer Somlata & Engineer Akash wedding details, Profile of Akash Roy husband of Somlata Acharyya. Famous Singer Somlata Acharyya Chowdhury tied the knot with Akash Roy on 23rd November 2012 (Friday). Yes, you are right; on 23rd November 2012 Bengali actor Soham & Tanaya wedding also took place. Let's check out Singer Somlata & Akash marriage photos & few details of Akash Roy & Somlata Acharyya Chowdhury wedding. Who is Akash Roy? Husband of Singer Somlata Acharyya Chowdhury is a Software Engineer by profession and currently working in Gurgaon. Singer Somlata Acharyya & Akash Roy wedding ceremony took place at Dalmia Bhavan of Kolkata on 23rd November 2012 and the Marriage Reception party took place on 25th November 2012. Many Tollywood celebrities were present at the wedding party of Somlata & Akash. Since, one of them is from Asansol; thus a special marriage party of Somlata & Akash took place at Asansol on 29th November 2012. Since Akash Roy, husband of Somlata Acharyya Chowdhury, works at Gurgaon Somlata will move to Gurgaon for few months now and will be back in Kolkata to resume her professional work. Good wishes to Akash & Somlata and hope both of them will manage Kolkata & Gurgaon household happily. Upcoming new Tollywood Bengali film Balukabela.com movie story review castings director producer actors actresses Balukabela.com release dates book buy tickets online Bengali Balukabela.com Parambrata, Locket, Rahul Banerjee, Payel Sarkar, Bratya Basu, Rudranil Balukabela.com Parambrata, Locket, Rahul Banerjee, Payel Sarkar, Bratya Basu, Rudranil. New Bengali movie review plot shooting location cinema halls showing Balukabela.com kolkata Bengal show timings upcoming hit Bengali cinema Balukabela.com watch online details information. Director Partha Sen, who has directed so many Comedy Television Serials, is now making his first Film titled 'Balukabela.com' featuring Parambrata, Locket, Rudraneil, Bratya Basu, Rahul Banerjee, Payel Sarkar, Indraneil and others. 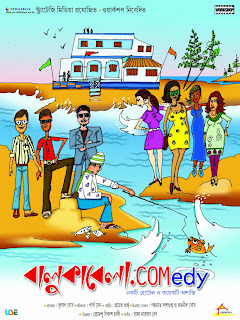 Filmmaker Partha Sen, making his Directorial Debut, is coming up with his Comedy based Romantic Bengali cinema Balukabela.com, which was premier at Bengali Film Festival in London [May 2012] and appreciated by the critics. • Balukabela.com Bengali movie Director Name: - Partha Sen.
• Balukabela.com Bengali movie Producer name: - Kunal Ghosh & Strategy Media Plus Communication Pvt Ltd.
• Balukabela.com Bengali movie story writer name: - Prachet Gupta. • Balukabela.com Bengali movie Music Director Name: - Raja Narayan Deb. • Balukabela.com Bengali movie songs were sung by eminent singers like Sayak, Pota (member of Cactus Band), Somlata Acharya & others. • Balukabela.com Bengali film Casts Actors Actresses: - Parambrata Chottopadhyay, Locket Chatterjee, Swaswata Chatterjee, Paran Bandopadhyay, Bratya Basu, Rahul Banerjee, Abhiraj, Indraneil, Rudranil Ghosh, Payel Sarkar, Suchandra, Ambalika, Tania, and others. • Balukabela.com Bengali movie Release Date: - 14th December 2012. • Balukabela.com Bengali movie Story Review: - Bengali film Balukabela.com is about four friends named 'Sayan', 'Arijit', 'Atanu' & 'Rabin' [characters played by Rahul Banerjee, Abhiraj, Indraneil & Rudranil Ghosh respectively]. All of them belongs to different professional life - Sayan (actor Rahul Banerjee) a teacher, Arijit (actor Abhiraj) a businessman, Rabin (actor Rudraneil Ghosh) a model and Atanu (actor Indraneil) a serviceman. Once, all of them decided to spend holidays together and thus booked a Hotel Balukabela at a sea beach location, where four girls arrived with their Teacher. Then on, all the funny incidents started and became love-pairs [four Girl characters played by actresses named Payel Sarkar, Suchandra, Ambalika & Tania]. There are quite a few sub-plots presented by the Director Partha Sen in Bengali film Balukabela.com. One of those sub-plots is about the story of newly married couple Pramabrata & Locket Chatterjee went for Honeymoon at that sea beach tourist location. Bratya Basu played a character who is trying to find out the route to Sri Lanka following the beaches and Saswato Chatterjee is playing the role of Locket Chatterjee's Boss. On the whole Bengali movie Balukabela.com is a Romantic Comedy Film presented by Director Partha Sen, who made his Film-making debut with this film. • Cinema Halls showing Balukabela.com Bengali movie: - The Bengali film Balukabela.com will be shown in these Cinema Halls of Kolkata & across West Bengal - Nandan-1, Metro, Darpana, Purabi, Prachi (noon show), Basusri, Malancha, Mahua (Garia), FAME (South City / Hiland Park), Ajanta (Behala), Ashoka (Behala), Ritwik Sadan, Big Cinemas (Salt Lake), Bioscope (Axis Mall, Rajarhat / Junction Mall, Durgapur), Jaya (Lake Town), Jaya City Mall (Barasat), PVR Avani Mall Howrah, Inox (Swabhumi / City Centre / Rajarhat / Siliguri-2), Kalyani (Naihati), Chayabani (Barasat), Jayanti (Barrackpore), Koiri (Chinsura), Sanskrity Lokmancha (Burdwan), Mini Sushma (Sheoraphuly), Eylex (Asansol) and many other Cinema Halls showing Balukabela.com Bengali movie in Kolkata & Bengal. New Bengali movie / Tollywood film Balukabela.com of Parambrata, Locket, Rahul Banerjee, Payel Sarkar, Bratya Basu, Rudranil seems to be worth watching in Cinema Hall; so start buy tickets online of Balukabela.com from www.bookmyshow.com website. Somlata (full name: Somlata Acharyya Chowdhury) is one of the eminent singer of Tollywood Film Industry and music arena. Singer Somlata has started her singing lessons since she was nine years old under the guidance of Pandit Biresh Roy (Guruji of Somlata). Since the age of nine, Somlata Acharyya Chowdhury has proved her versatility and made her mark with various genres of music and forms like pop singing, classical songs, western music, Rabindra Sangeet etc. • Somlata Acharyya Chowdhury marriage date: - 23rd November 2012 (Friday). • Husband name of Somlata Acharyya Chowdhury is Akash Roy, Software Engineer by profession [Check Somlata & Akash wedding photos]. Singer Somlata has started doing playback singing in Bengali Cinema from 2009; but eventually came to notice after the sensational singing in Anjan Dutta's Ranjana Ami Ar Asbona Bengali Film. In other word, we can say, Somlata arrived with her versatility in music arena with the film Ranjana Ami Ar Asbona, in which Somlata has created her place in all music lovers mind. Singer Somlata Acharyya Chowdhury has sung songs as playback singer in Bengali film Box Number 1313 (2009), Cross Connection (2009), The Perfect Woman (debut as playback singing), Ranjana Ami Ar Ashbona (2011) till now. Singer Somlata Chowdhury also hosting a show named 'Take A Break' on Tara Muzik and recently did a music album with Shaan, Shreya Ghoshal and others for Tsunami Relief Fund. Somlata Acharya Chowdhury is not only a famous Singer; but also a Guest Lecturer of Psychology at Asutosh College, Kolkata. Search tags: Ranjana Ami Ar Asbona film Singer name, Somlata Acharyya Profile Biography family contact number, Singer Somlata Singing Career birthday personal life.